Those responsible for launching the Bermuda Sun joined former Premiers and public figures in lamenting the demise of the paper. Sir John Swan and Alex Scott praised the newspaper for its fair and impartial reporting. He described the end of the paper as a ‘sad day’. Mr Augustinovic added: “I was in charge of the preparatory — typesetting, paste-up, camera and plate-making. Typesetting was particularly interesting as we used tape-driven Friden Justo-writers — the intermediary method between hot-metal type-casting and future photo typesetting. “Island Press was the first company to purchase such equipment from the US, requiring special permission regarding technology transfer. “I well remember the excitement of producing and distributing the first Bermuda Sun, with Don French and Warren Brown out on Victoria Street, loading up numerous taxis with bundles of newspapers which were delivered free island-wide. 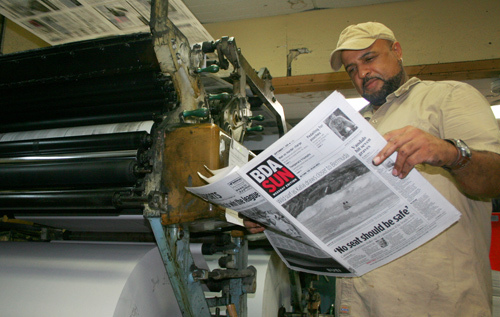 “Printing by web offset was new to Bermuda and allowed the Bermuda Sun to print photographs of a better quality. “It was one of the reasons for the initial success of the newspaper and the decision to go from weekly publication to daily publication at very short notice, a decision that could not be sustained as Bermuda already had two daily papers at the time — the Royal Gazette and the Mid Ocean News. Meanwhile, former Premier Sir John Swan praised the Sun’s contribution to Bermudian society. He said: “The Bermuda Sun has, without bias, portrayed the realities of our society and issues that affect us politically, economically and socially to the extent that it recognized its responsibility as an unfettered information source. The paper’s commentaries have been profound and informative. “I wish to commend the Bermuda Sun and all those who contributed to the paper outside the normal employees. He added: “The Royal Gazette now has an even greater responsibility in portraying all aspects of information to the public. Former Premier Alex Scott said: “We never thought we would witness the Sun going down on Bermuda. I was devastated when I heard the news. It is very regrettable. It is Bermuda’s profound loss that we are losing an institution. “The prospect of Bermuda continuing without another voice in print is of grave concern to me. Stuart Hayward, chairman of BEST, first began work as a columnist in the Sun in the 1970s and has been a consistent contributor to the paper ever since. He said: “There is a part of me that will go, when the Sun goes. Acting Governor, Ginny Fearson, added: “I was very sad to hear this will be the Bermuda Sun’s final edition. “I know the Sun newspaper has been an important part of Bermuda’s history and has, through its online presence, worked hard to keep pace with changing trends in news delivery.